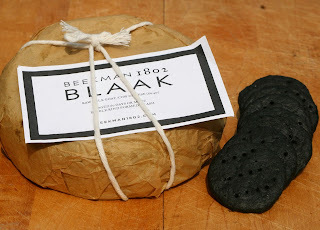 There was a lot of interest in our charcoal biscuits, from yesterday's post. Activated charcoal has been a food additive since the 19th century. It's original use was as a medicinal aid for stomach disorders. A bit of charcoal powder was taken with water. 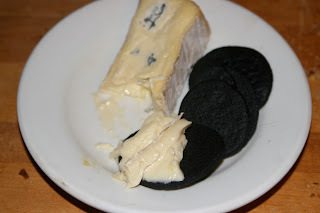 As one might guess, this was not terribly palatable and the powder was later added to biscuits or cookies Think of them as big, black Prilosec cookies. Even now, activated charcoal is used as a poison control when one's stomach is pumped. What a lovely image for preparing crackers. The biscuits or cookies as we call them, were quite popular in England and are thougtht to have originated with John Longman Bragg. A professional baker, J.L. Bragg, added the popular, but messy charcoal powder to cookies and a new industry was born. The cookies took off and soon they found their way to Harrod's and other fine grocery stores. In addition, they were sold at chemist shops and advertised in such august publications as the British Medical Journal. The biscuits fell out of favor in recent years and for a short time J.L. Bragg discontinued them, causing such an uproar that they were quickly re-introduced with fancy packaging. Today J.L Bragg is the only United Kingdom company licensed to make medicinal charcoal products but don't let that stop you from venturing out. In 1910, C.L. Russell's book on confectionery included the following recipe. Rub the butter very finely into the flour, make a bay, add sugar and eggs, and whip up by the fingers to a thick cream, draw in the flour, into which you have previously mixed the charcoal, and make to a nice biscuit dough. Roll out fairly thin, cut out to any desired shape, wash with water, and bake in a good sound oven, taking care to see that they are thoroughly well done. 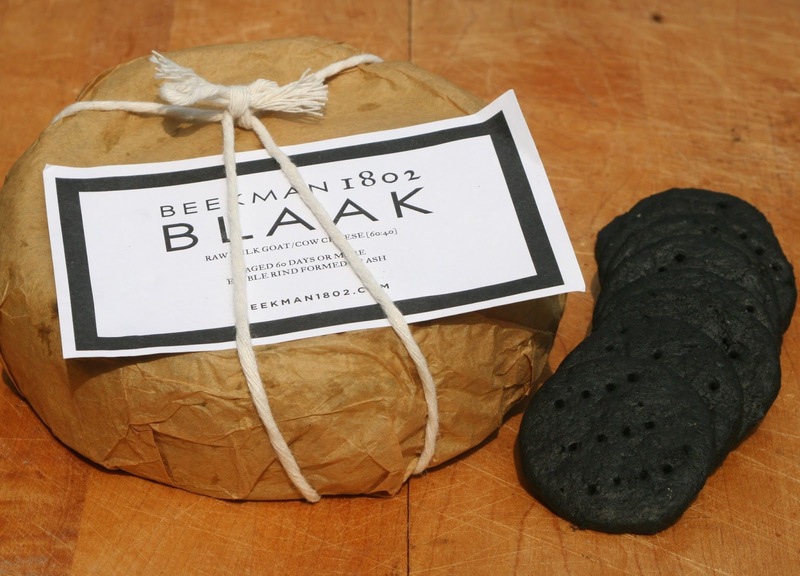 In order to make charcoal crackers you need the charcoal which is easily available online. Now would be a good time to tell you the downside of cooking with charcoal as an ingredient. If you want to know what it is like, I suggest you don your favorite white shirt and venture out to the grill. Dive down into your bag of charcoal as if there is a $20 gold piece at the bottom of the bag. When you don't find it and the dust makes you sneeze, be sure and cover your mouth. Then swat at the mosquito on your arm. then scratch your ear. Now take a look in the mirror and imagine your counters and mixer and sink and floor all dusted in black. Every time I have ordered charcoal it has come nicely measured in a paper bag. It is much easier to work with in a glass container. The transfer of from the bag to the glass, is well, just take my word for it and do it OUTSIDE. Make sure that you counters are clear and uncluttered as you want to touch as few thing as possible. I find that it is best to go ahead and lay down some plastic wrap on your work area. Plastic wrap is also important in making the crackers. One can mix the dough, then form it into logs, freeze and slice or one can roll out the dough and cut it. The best way to roll it is between two sheets of plastic wrap. It is really no more messy than making a red velvet cake and turning everything crimson. But it is messy so be forewarned. The cracker recipe is beyond easy. In a stand mixer, cream the butter until fluffy. Add the flour, charcoal, and salt. Mix until a crumbly. Add water and mix till dough comes together. Dump the dough on a sheet of plastic wrap. Form into a log, wrapping it in the plastic wrap. Freeze for at least 30 minutes. Remove the log and slice the dough into thin rounds. Place the rounds on a cookie sheet lined with parchment or a Silpat. Dock the crackers with a fork and bake for 20 minutes. As an alternative, wrap the dough in plastic wrap and refrigerate for at least 30 minutes. Roll the dough between sheets of plastic wrap and cup with cookie cutter. If you want flat, uniform crackers, try this. After you have placed the cookies on the lined cookie sheet, top them with a second sheet of parchment or another Silpat. Weigh them down with an identical cookie sheet and bake. The weight of the second cookie sheet keeps them flat. Not the best picture, but you can see the cracker on the left was sliced and docked. The one on the right was cut and baked weighted down. It is simply a matter of how you want them to look. The charcoal gives the crackers a bit of grittiness. There is no strong taste, which makes them a nice compliment to cheese. I especially like them with a soft blue like Cambozola. One of my favorite dishes for charcoal is simple cornbread. Adding a tablespoon or so of charcoal creates a black cornbread. I cut out rounds of the cornbread and use it to top a plain potato soup or chicken hash. The contrast of color is striking. Don't forget Fido. Charcoal is a great additive for homemade dog biscuits. So go forth and be adventurous. And don't smile at anyone. Sounds like a good digestive. There are some small black pills at the Chinese Market that will cure an upset stomach in seconds. I looked on the label and it said creosote. Like tar? I guess there is a creosote bush in West Texas.